People have asked me if I could share my yearly planning process and how it relates to the use of the Everything Notebook. I have also been asked if I use other planners and whether they’ve worked for me. I’ll answer both questions in this post. There are many planning and organizational methods out there, and there are several brands for yearly/monthly planners that many people (particularly fellow academics) have been testing out. I’ve been working with the idea of an Everything Notebook for way too long to test a new planner, particularly because I have my own method. So that’s what I will share here: how I do my yearly planning, using an Everything Notebook. @raulpacheco I'm impressed by your year long planning, do you have a blog post discussing your strategy for planning? The first thing I do is print out a year-long calendar, and a set of 12 monthly calendars. Since I do everything analog and old-school, I need to have the physical printouts and coloured pens so that I can cross-post to my Everything Notebook. I then use all the conferences and workshops I have planned to attend or at least I’m interested in doing as a heuristic to know when I’m going to do something. Teaching (which I normally do in the fall semesters, 2 courses at a time) helps me with anchoring the fall semester, and I use the time slots for my classes as organizing heuristics to plan the rest of the year. For many people, it will look as though I’ve only planned seven months out of the twelve when they look through the yearly calendar. This is precisely because I use conferences and workshops as the anchoring point for what I am doing in a particular year. If I know that I have a certain number of seminars, workshops, talks and conferences to attend and present at, I can use the certainty of those dates to put firm dates on specific deadlines. So, for example, the last conference I am committed to participating in is the International Association for the Study of the Commons (IASC 2017) in Utrecht, the Netherlands, in late July of 2017. I know for a fact that the American Political Science Association (APSA) will take place in August, but since I don’t know if I am accepted or not, I left a blank space in my calendar just in case it will need to be added. As you can see, I have 6 papers committed for the conferences I have planned, but I have more way conferences than papers (either committed to, or at least, interested in presenting at). This is because I actually don’t know what I will be submitting for an abstract for each conference at the moment. Given that I have funding for conferences for this year, I’ll most likely submit an abstract on a public policy issue for ICPP and one for water conflict for IASC 2017. The others are relatively easy to think through given that I might be doing similar papers as in previous conferences, or I may do extensions of a specific one. For example, for CPSA and CALACS, I might most likely do something on bottled water. And for PMRC I might do something on teaching public administration. The one I can’t miss at all is the one I am coauthoring with Dr. Amanda Murdie and presenting with her at the International Studies Association ISA 2017 in Baltimore. To be able to plan the entire year, I printed out a yearly calendar for 2017 using TimeAndDate.com’s templates and then asked to show Mexican holidays. If you’re in Canada, obviously, you may want to show the Canadian holidays. @raulpacheco how do you plan your papers ahead of time? How do you know what you'll write a whole year ahead? Revise and resubmit in 2017. These are the papers that I need to revise during the year and resend. Probably rejected pieces, or R&Rs where I submitted them in 2016 but will need to resubmit in 2017, once the changes are made. To be submitted. These are manuscripts that are THIS CLOSE to be finished, but that I have not submitted yet because I haven’t been able to finish the tiny little changes that make them a final submission (like, reformatting for a specific journal, etc.) These manuscripts are the reason I created the hashtag #GetYourManuscriptOut. Dormant papers that all they need is a swift kick and off they go! To be written and/or completed. These are papers I’ve been thinking about writing or commitments I have with specific granting agencies (for example, for my National Problems CONACYT Collaborative Grant, I committed to write 3 papers on each case study where I conducted ethnographic research. So, I plan to write at least one of them in 2017. Also, drafts of papers I already started writing that need to be finished. For example, I’m writing right now on the social construction of water scarcity in Mexico. That paper has been in draft for a while (also, the reason #GetYourManuscriptOut exists), so I plan to finish that paper this year. I am super analog with this process, so I print out monthly calendars and insert my daily commitments (you can pre-fill your Google Calendar with your commitments and THEN print them out, or do the reverse). I usually just schedule the major commitments there, as I know that (as Dr. Adam Wellstead has said, sometimes my weeks change, so I need to maintain a big-picture kind of approach here). @mmartin_edu @raulpacheco That kind of approach doesn't work for everyone. I have a vague idea of my year long plans but go week by week. I fill out my commitments for all conferences in each monthly calendar, including when I am supposed to fly in and fly out. One important thing in the planning process for me is that I include my commitments ONLINE and OFFLINE, both simultaneously. That is, I schedule a month at a time, both on my Google Calendar and on my printed calendar. They need to be synchronized for my systems to work. I can’t just plot all my conferences and then forget about them. 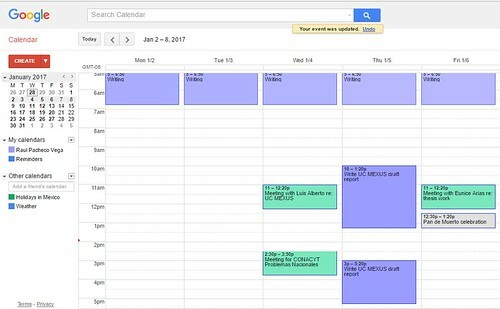 So instead of plotting everything on my printed monthly calendars and then copying all the events on Google Calendar, I insert all events on GCal until I finish doing the scheduling for the entire year. One month on paper, one month digitally. Dr. Matt Lebo’s excellent paper on how to manage your research pipeline shows you how to plan a paper and back-track until you know when you need to do what by when. This template offers guidelines and sequential steps for how to do backward planning (reverse planning). This template shows a very brief and simple but useful example of how to do reverse planning for exams. The same technique applies to when you write a paper. I need to make sure that the synchronization of my monthly activity plan with my Google Calendar is complete, otherwise I can double-book myself (which has happened before). Now, a lot of people ask me how do I plan by week and by day. I haven’t written a “How I do my Weekly Planning” post, but my original Everything Notebook post describes how I move from monthly planning to To-Do Lists per week. I also have an instructional video (forthcoming) on how I do the assemblage of the Everything Notebook. So far, I’ve scheduled my tasks per month (commitments in terms of conference papers, meetings, etc.) From each monthly planner, I prepare weekly To-Do Lists. For example, for the first week of January I have 5 meetings (two with students, and three with my research assistants, my project participants, and my project manager). I can transfer those tasks on to my Weekly To-Do list, and insert a tab marking that specific week in my Everything Notebook, as shown below. If you collaborate within a laboratory, or with other colleagues, Amy Wooldridge’s suggestion is brilliant. As I’ve said before, my methods are there to be adapted and if they help you with your own productivity, I’ll be a happy camper, since they help ME with my own workflow! Tagged with Everything Notebook, organization, planning.